I know this seems like a summertime dish, but with the weather as warm as it was this week, I couldn’t help myself. 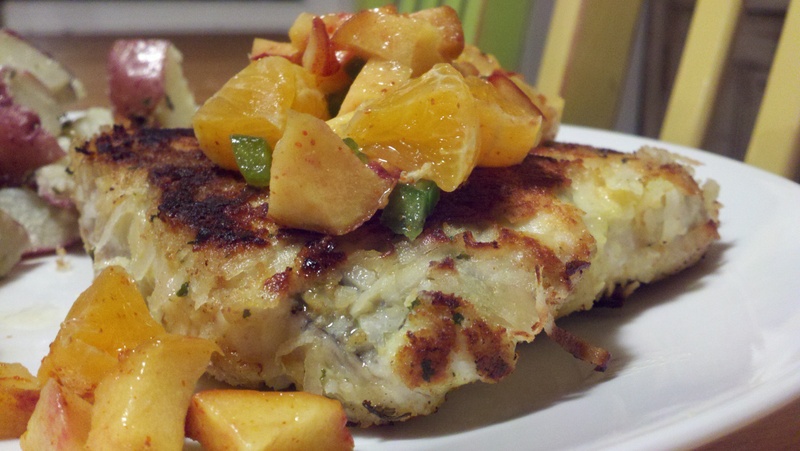 There were a few filets of Wahoo in my freezer that were practically begging to be defrosted, doused in sweetened shredded coconut, and topped with a tropical fruit chutney. This fish would go great with a side of rice, overtop of a salad, and/or accompanied by a drink with a little umbrella in it. Enjoy the warm weather!! In a bowl, combine the fruit and jalapeno. Squeeze lime juice overtop and refrigerate while preparing the rest of the meal. Line up 3 small bowls, one with the flour, one with the egg, and one with the breadcrumbs and coconut combined. Season the fish with salt. Dredge each piece of fish in the flour, then dip it in the egg, then encrust it with the breadcrumbs/coconut mixture. Preheat a couple Tbsps of olive oil in a frying pan. Fry fish, flipping once, til coconut is browned and fish is cooked through. Top with fruit chutney.